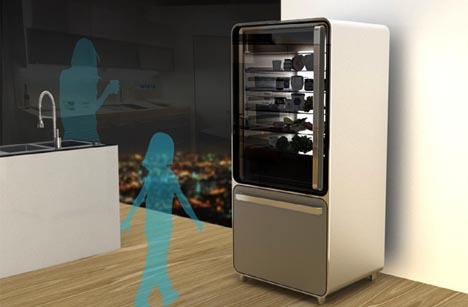 SAEBA.COM: Futuristic Smart Fridge: Input Ingredients, Receive Recipes! No more standing there with the door open, pondering what in the world you might cook for dinner from the hodge-podge collection of ingredients laid out before you. 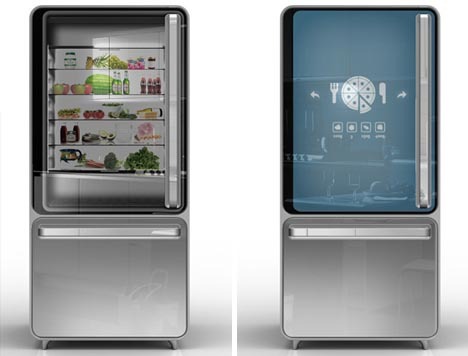 This very very smart refrigerator – that knows your tastes and what it has chilling inside – will display a menu of meal-making options based on the food you already have! Instead of simply opting for a frozen entreel, you can select something ranging from mundane to exotic, indulgent or healthy in accordance with your wishes and in combination with the ingredients entered into the multi-touch, front-door display screen when you last stocked up on groceries and stored inside your fridge just as easily as the food it is used to keeping cool. Once you have made your selection and removed the required components, this eerily intelligent fridge also vocally walks (or rather: talks) you through the process of cooking in a step-by-step fashion, like an interactive computer cookbook or perhaps (since celebrity voices are becoming popular in other systems such as car GPS units) a real-time pro chef at your back. If you still feel the need to see first-hand what lies in store for you behind the door, another push of the button turns the electrochromic surface transparent so you get a real look at the food available. When you are finished, the panel reverts to its former digital display on an opaque background. 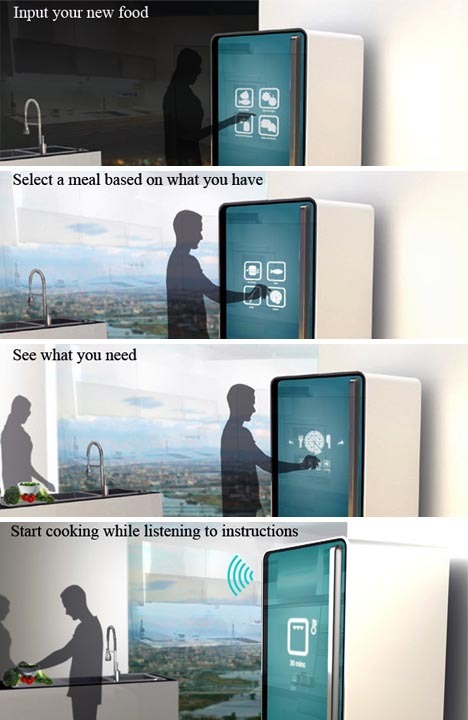 Alas, as with so many good designs, this kitchen appliance concept by Ashley Legg remains (for now) a prototype – but given how far multi-touch screens and interactive digital media have come, it is not a far-fetched idea. Good information on this blog. Also, it is really nice to listen all your words. Thanks for sharing this. Very good! I think that you have done a great job! FANTASTIC!!! !